Even though there is only about one month of spring officially left on the calendar, the weather here in Casper always leaves us guessing. Spring cleaning is an annual project that rejuvenates the house and yard in preparation for the beautiful summer months. Summer is often a time spent hustling and bustling around town, on vacation, and doing more things than you ever thought possible during one season. So to help your house keep up with your busy summer life, a thorough deep spring cleaning is highly recommended. Most of the items within this guide are great for you DIY-ers while others can be better accomplished by some hired help. By working together, you can have your house in tip-top shape before the end of spring. It’s time to gather your cleaning supplies and some helping hands to knock your spring cleaning out of the park. We’ve divvied up the guide in three parts: routine chores, semi-annual chores, and annual chores. The routine chores are ones you’ve probably been doing all year, but there may be a few thrown in that are best done monthly or seasonally. This is your time to go the extra mile on these regular chores. The semi-annual chores are ones to do in the spring and then again in the fall, and the annual chores are ones that can be done just once a year – so why not add it to your spring list? Dust: Everything should be wiped down with either a feather duster or a damp rag. It’s best to start with dusting because it’ll kick up a lot of dirt and grime into the air that can be cleaned as you move through the rest of your chores. Don’t forget about the tops of bookshelves, light fixtures, walls, blinds, and ceiling fans. Remove books from shelves, move the refrigerator away from the wall, and take pictures off the walls to really give the house a thorough wipe-down. “Rinse”: After dusting, take a rag and some 409 and get goin’ on the metal (or really nice plastic) in your house. Clean the door knobs, light switches, and switch plates. Not only does this remove any excess dust, but it helps disinfect these commonly touched places from the left-over winter germs. Floors: Sweep and vacuum every square foot of floor inside the house. Then, do a deep clean too. For hardwood and tile floors, you can mop and polish the surface for a shining new look. 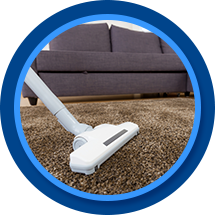 Carpeted floors can be steam cleaned to get rid of any dirt and chemicals that may have been dragged in from the wintry streets. You can rent a steam cleaner from a local hardware store, or this can be hired out for professional carpet cleaning. Windows: Cleaning the windows are a pretty straightforward chore. You can take it the extra mile by cleaning any screens or the exterior side of hard-to-reach windows. If you have windows that are inaccessible, this too can be a chore for pros who will have the equipment to get the job done quickly and easily. At this point, all commonly used surfaces should be dusted, wiped clean, and disinfected. Cupboards and Pantry: It’s easy to stockpile food over the winter, so by the end of spring chances are your cupboards are bursting with canned and boxed goods. Now’s a great time to clear out everything from the cupboards. Start a few donation piles while you’re at it. You can donate food you don’t want (but is still good) to the food bank and old dishes or utensils you haven’t used all winter to the local center. Once everything is out of the cupboards/pantry, wipe down the shelves before you re-stock for the summer. Refrigerator: Like you cleaned out the cupboards and pantry, you’ll want to clean everything out of the refrigerator, wipe it down, and make sure it’s ready to go for a summer full of BBQs! If you have a refrigerator/freezer combo, now’s a great time to clean out the ice maker too. HVAC: A tune-up of your air conditioner, heater, or swamp cooler is a great way to kick off summer and winter. This is one of those chores best left up to the professionals so you aren’t left with a broken unit on the hottest of summer days. A pro can spot any kinks in the system and can usually get them repaired for an affordable price. Declutter: Go through every room in your house and get rid of things you haven’t used all winter (aside from items that are obviously seasonal). Add to those donation piles you started with your cupboards or maybe even consider hosting a garage sale to try and make a couple of bucks to get you started on a fun summer ahead. Now you’re ready for the beastly annual chores! Basement and Garage: For most people, an annual sweep through the basement, garage, and other storage areas can be quite helpful. You’ve already decluttered the rooms, so now it’s time to move around the furniture and other stationary pieces in order to clean the floors and get everything spick and span. Paint: Once a year, go around the inside and outside of the house with a can of touch-up paint. Cover up any nicks and scratches to help your rooms look like brand new. Files: Now that tax season has passed, it’s a great time to head into the office and organize any files that may have gone astray throughout the year. It’s a good rule of thumb to keep financial records for the past seven years (that’s how far back the IRS will audit), so you can throw out all files older than that. Keep files from years ago in separate boxes and put them in storage and out of the way, so your office space can be left for important papers from the most recent year and the days to come.